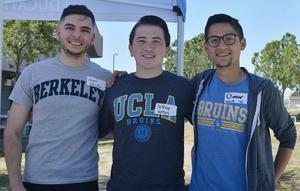 Over 200 Lynwood Unified students received tips for navigating the college admission process and for choosing among majors and career paths during the District’s 19th annual Alumni College Conference on Sept. 22. Keynote speaker and Lynwood Unified alumnus Rene Lozano shared with students his pride at becoming the first in his family to attend college. Lozano earned a bachelor’s degree in sociology and a minor in education from UCLA, as well as a master’s degree in multicultural counseling from San Diego State University. He is pursuing a doctorate in educational leadership for social justice from Marymount University. Lozano serves as transfer center coordinator at El Camino College in Torrance, where he helps students transfer from community college to four-year universities. For 19 years, Lynwood Unified School District has partnered with the Lynwood Alumni Association (LAA) to inspire students to reach their college and career goals. The annual conference event brings together alumni to mentor to students who are pursuing education after high school. Representatives from more than 20 universities attended this year’s event, including USC, UCLA, Cal State Fullerton, Harvard and Pepperdine. Representatives discussed topics such as college life and financial aid options. College and Career Conference Chair Yvette Torres said about 80 alumni participated this year and that 2018 alumni chose to volunteer, as well. This gave students an almost real-time glimpse of their post-graduate transition. Student attendance rose this year, in particular among AVID and ASB students.